By the time you get into the realm of microwaves, wavelengths are so short that using discrete components for reactive elements is impractical or impossible. That is where the "magic" of electromagnetic fields kicks in. Prior to the advent of computer simulators, the design, construction, and adjustment of distributed element printed circuit boards and waveguide were not for the feint of heart. Whereas "seat-of-the-pants" tactics often resulted in a successful circuit, guesswork was (and still is) too expensive in terms of time and materials to be employed in the spectrum at and above microwaves (approximately 2 GHz). 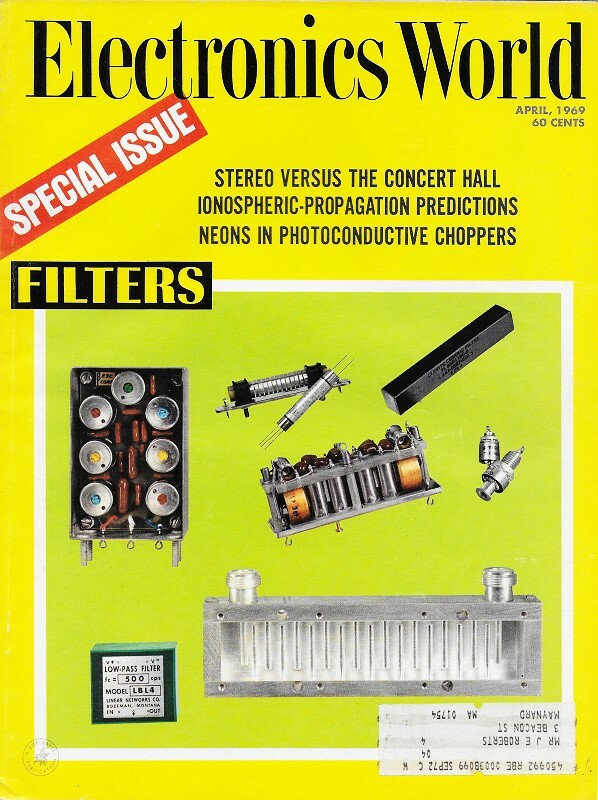 This article from a 1969 issue of Electronics World magazine is one of ten in a special section on electrical filters. The author joined Microlab/FXR in 1959 and in his present position is responsible for the coordination of all filter and custom product design and development contracts. 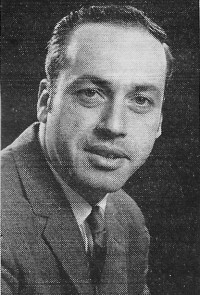 Prior to joining the company, he was associated with ITT Federal Laboratories where he was involved in the development of communications and radio navigation equipment. He received his BSEE from Lafayette College in 1958 and an MSEE from Newark College of Engineering in 1962. He is a member of the IEEE and the IEEE Professional Groups on Microwave Theory and Techniques and Circuit Theory. He is also a member of Tau Beta Pi and Eta Kappa Nu honorary groups. No new breakthroughs; just better made parts. Here's what the system engineer should consider when choosing a new microwave filter design. Microwave filters are unique. The frequency spectrum they cover is quite large, overlapping into the area of lumped-constant filters at the low end and into the "millimeter wave" region at the upper end. There is some confusion because most engineers and scientists cannot agree where the microwave frequency spectrum really begins or ends. For traditional reasons, however, and probably for reasons developed by the industry itself, the practical microwave region starts at 100 MHz and runs up to frequencies in excess of 18 GHz. Microwave filter types include high-pass, low-pass, and bandpass units whose bandwidths range from a fraction of a percent to an octave or even more; narrow- and wide­band band-reject types; elliptic function filters with extremely steep rates of rejection; complementary filter pairs; continuous channel diplexers; combination networks to act as channel separating and multiplexing devices; lossy wall and mode suppressing filters; directional filters which have the properties of directional couplers but exhibit bandpass and band-reject characteristics depending on which ports are chosen as input and output; and filters used for phase correction networks and delay lines. Types and applications are a never ending list. What Makes a Microwave Filter? Anyone who has worked in the lower frequency regions or with an FM or TV tuner knows the problems that can be encountered due to stray capacitances or excessive component lead lengths. Microwave filters overcome these difficulties somewhat by the use of distributed rather than lumped elements. Thus, the microwave filter engineer uses transmission line lengths and characteristic impedances rather than commercial capacitors and coils as the elements of design. In the v.h.f. and u.h.f. regions, there is overlapping and some combining of the lumped-element and distributed-element design. These filters are classed as "hybrids." At higher frequencies almost all filters are constructed of parts made on lathes and milling machines. In the past ten years, microwave filters have undergone a vast change. The major stimulus to this change has been the tremendous activity generated toward what is called "modern network theory" as opposed to the older and more pragmatic "image parameter" method of design. Modern network theory has not only made possible practical bandpass, low-pass, high-pass, and band-reject filters to more optimum specifications, but also has led to a variety of new types and configurations. Two examples of distributed-element bandpass structures are shown in Figs. 1 and 2. Fig. 1 is a 19-resonator interdigital filter constructed of alternately shorted round-rod quarter-wavelength resonators in a metal housing. Fig. 2 is a five-resonator comb-line device constructed of parallel-coupled, capacitive-shortened rectangular resonators in a metal housing. In both cases, the filters could have been constructed from round rod, rectangular rod, or strip-line. For the interdigital filter, each rod or resonator is the microwave equivalent of a low-frequency "tank circuit." For the combline filter, the same is true, except the input and output bars act as transformer sections, not resonators. These are only two examples of devices which are popular in microwave systems. Fig. 1 - A 19-resonator interdigital filter made of alternately shorted quarter-wavelength rod resonators in metal housing. Fig. 2 - Five-resonator comb-line filter using capacitance tuning. Other technologies, the call for miniaturization, and economic pressures have all influenced microwave filter technology. Some filters can be fabricated using printed-circuit strip-line techniques. A strip-line filter is, in itself, not a type of filter but a type of construction. Many types of microwave filters can be constructed in printed strip-line, but most strip-line filters are of the moderate and wideband bandpass type. Printed strip-line filters are designed utilizing distributed elements, as were the comb-line and interdigital previously discussed. But printed strip-line elements more often take the form of open or short-circuit quarter-, half-, or three-quarter wavelength stubs of varying widths. Typically these stubs are interconnected by quarter-wavelength coupling lines to yield the desired design characteristic. Recently, printed strip-line filters have replaced their fabricated, thick-strip predecessors in some system applications, but printed-circuit filter components probably account for less than five percent of all microwave filter component applications. Strip-line filters are more often used with other printed-circuit devices such as directional couplers, mixers, hybrids, etc., where all the components may be integrated and reproduced on one circuit board. Two major drawbacks to printed-circuit filters (and possibly the reasons why they are not used as much as one might think) are bandpass insertion loss and temperature instability. These factors are dependent on the nature of the filter, and upon the resistive losses and thermal characteristics of the dielectrics of the copper-clad materials which are presently available in the industry. Helical-line filters have become quite popular below 1000 MHz because the slow-wave property of the helix (it takes r.f. energy longer to travel circularly along a helix than along an equivalent length of coaxial transmission line) permits length and volume savings on the order of three times or more. Fig. 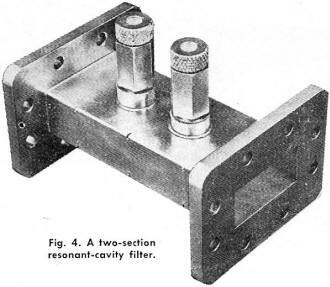 3A shows a typical four-resonator helical tubular bandpass filter. The design is "hybrid" in nature. The "coils" are actually distributed elements which have been precisely calculated as lengths of helical transmission line. Each helix is soldered to two adjacent shunt bead capacitors which have predetermined values and are calculated as dielectrically loaded concentric coaxial cylinders. These two capacitors and one helix form one resonator. The resonators are coupled to one another through dielectric spacers which are located between the faces of adjacent beads. The input and output capacitors are shunt elements. The lumped-element equivalent circuit diagram is shown in Fig. 3B. Because of this configuration, helical tubular bandpass filters have a steep (slope) rate of rejection at the upper frequency cut-off point and a reduced rate on the lower frequency rejection slope. A filter such as the one illustrated is typically about four inches long and one-half inch in diameter at 400 MHz. YIG filters are a newer type of filter which finds application in some systems. Yttrium iron garnets are used to construct miniature cavities (YIG filters) which can be electrically tuned over octave bandwidths. Fig. 3 - This hybrid filter (A) and its equivalent circuit (B) is typical of helical tubular band-pass types. Microwave filters have some special characteristics and exhibit some phenomena not normally associated with filters at other frequencies. This is true despite the fact that the design theory is exactly the same as that used at all other frequencies. Most coaxial systems are 50-ohm systems, therefore most coaxial filters quite naturally are specified with 50-ohm input and output impedances. Some v.h.f. systems are 72 ohms or 93 ohms. On the other hand, waveguide filters are not normally specified by impedance, but rather by waveguide size. Thus the typical two-section cavity shown in Fig. 4 would be specified to work over a frequency range in WR-137. This is because the true impedance of the waveguide is not constant but varies with frequency and therefore is not a practical parameter. "Q", or unloaded "Q" is not usually a problem in microwave filters. The geometries, configurations, and boundaries required by microwave structures usually assure a reasonable "Q" is available. In the worst cases, insufficient "Q" will be translated into an undesired passband insertion loss. In multi-resonator filters, "predistortion loss" associated with finite "Q" and predictable as a function of phase slope or group time delay will cause additional transmission losses at passband edges. Temperature drift can be a problem with microwave filters, particularly with narrow-band cavity devices. These filters are typically used as preselectors in microwave receivers. Cavities are normally temperature-compensated in the mechanical design or constructed of relatively temperature stable materials such as invar, a nickel-steel alloy. Moderate or wideband devices do not demonstrate as much deterioration of performance or frequency drift in severe temperature environs except possibly in systems which require a high degree of absolute and relative phase and group time delay stability. As was previously stated, microwave filters are designed from the same basic theory as all other resonant devices, and therefore tabulated information about rejection curves, shape factors, passband ripples, "Q", phase, insertion loss, etc. is also applicable to all microwave filters. Fig. 4 - A two-section resonant-cavity filter. It is important for an individual who selects and specifies a microwave filter to recognize the special properties of certain filter types. For example, low-pass microwave filters mayor may not be required to pass signal from d.c. to some cut-off frequency, fc, but the stopband must have some finite upper limit, i.e., six to ten times fc. The upper limit of the reject band will, therefore, not extend to infinite frequency. Microwave high-pass filters have rather special properties. In fact, there is no such thing as a true microwave high-pass filter! This is due to the distributed nature of the elements. A microwave high-pass filter is actually a wideband bandpass filter or pseudo-high-pass filter. Thus, although the band may reject d.c. to some desired frequency, the actual passband will extend from some cut-off frequency, fc, to some other finite frequency, fh, but does not continue indefinitely to some higher operating frequency. Waveguide filters can cause problems because each standard waveguide range covers only a relatively small portion of the frequency spectrum, or a useful frequency range of roughly thirty percent. On the low side, the waveguide itself cuts off and behaves like a high-pass filter. Above the useful range, energy propagates in modes other than the fundamental TE10 mode, and thus structures which are designed to work within a given waveguide range are only useful in or below that range. A waveguide band-reject filter will not pass frequencies below the waveguide's cut-off point even though it may yield the desired "notch" and close-in passband performance. Microwave filter users should be aware of the limitations of typical coaxial and strip-line structures. Filters such as those shown in Figs. 1 and 2 are designed using distributed techniques and, in general, these structures become periodic with frequency. Typically, microwave bandpass filters constructed with quarter-wavelength resonators exhibit additional passbands at odd harmonics of their center frequencies. Bandpass filters constructed of half-wave resonators exhibit additional passbands at all harmonics. Low-pass filters or elements are often used in conjunction with bandpass structures to eliminate harmonic problems. Coaxial and strip devices can also exhibit mode problems (i.e., spurious responses in their reject bands) when the dimensions of their structures become significant compared to a wavelength at some higher frequency. A good filter designer will consider these problems, based on the specification given. The last two characteristics were placed at the end purposely because they are only significant in certain short, fast-rise-time pulse and narrow-band FM systems. The list neglects two significant parameters not controlled by the filter designer - the source and load impedances. Uncontrolled source and load impedances can degrade filter performance and cause voltage breakdowns in a perfectly designed filter. A v.s.w.r. of 1.3:1 for components or networks adjacent to the filter should give good results. Make or Buy Your Filter? Much pressure is being put on systems engineers to design their own filters. At first glance, there seems to be some valid reasons for this. Miniaturization requirements and the advent of integrated circuits for the computer and aerospace industries have caused all technologies to be looked at in other than traditional ways. Strip-line circuitry has shown the obvious possibility of eliminating connectors between networks or components. System sophistication has increased the communications and interface difficulties between contractors and vendors. And, tons of handbook material have been published about microwave filters in the past several years. But, a filter should be made in-house only when the proper engineering ability is available, and then only if there are complementary pragmatic skills available to take over where the handbooks and theorists leave off. On the other hand, buying a microwave filter is relatively easy. There are many companies which specialize in microwave filters and have the facilities to provide certain types of filters as catalogue or near-catalogue items. At the very least, they can advise on feasibility based on specifications. Thus, the answer is obvious. It's usually easier and cheaper to buy filters. The prices of microwave filters depend on the type, the complexity, and the environmental conditions under which the filter must operate. Typically, tubular filters require less machine and fabrication time and therefore are normally less expensive than other filters. Tubular low-pass filters of transmission-line or helical construction sell for just under $50 to $300. Tubular high-pass and bandpass filters cost between $100 and $400. Basic waveguide cavity filters may be priced from $250 to $500, but higher-order-mode waveguide devices can cost $3000. The comb-line and interdigital filters fall in the $250 to $500 category. Tunable coaxial preselectors may cost as much as $750. Printed strip-line filters may cost between $50 and $200, in quantity, after the initial photography and artwork costs have been amortized. Incidentally, this pricing information is given as a guide and the reader should realize actual costs are based on a particular specification.